The Economic Development Division of the Regional Chamber works to promote activities related to business attraction, expansion, retention, creation of infrastructure, and workforce development by cultivating partnerships and a business-friendly environment that encourages the investments necessary to support new business opportunities. Lawrence County, Pennsylvania is located in western Pennsylvania, along the border with Ohio. Our largest municipality is the City of New Castle located in the center of Lawrence County. New Castle is classified as a Micropolitan area, and in the 2018, Policom Economic Strength Ranking list, it is ranked the 251 strongest out of the 550 Micropolitan areas in the United States. The City of New Castle, by ground transportation, is approximately 19 miles east of Youngstown, OH, 53 miles north of Pittsburgh, PA, 100 miles southeast of Cleveland, OH, 388 miles west of New York City, NY, and 428 miles east of Chicago, IL. 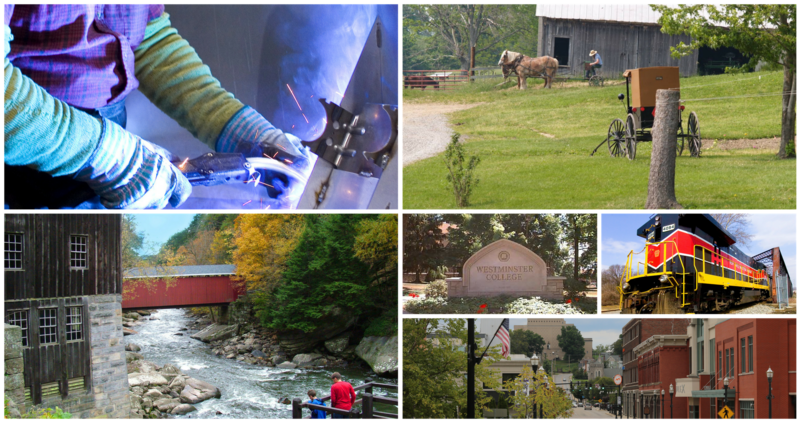 Lawrence County provides multiple lifestyle choices ranging from New Castle’s urban area to rural Amish farms scattered along the northern reaches of the county. Lawrence County has 27 local governments and 8 independent school districts. Many of our school districts have been named to the top 10 performers on standardized tests, as well as, winning a national blue ribbon for high student achievement. Besides being an outdoor paradise with significant green spaces and rivers, Lawrence County is home to leading private employers, such as: UPMC Jameson Health System, Westminster College, Liberty Mutual Insurance Company, Ellwood Group, Dairy Farmers of America, InfoCision, Bruce & Merrilees Electric Co., McKesson Corporation, North American Dental Group, and several others.